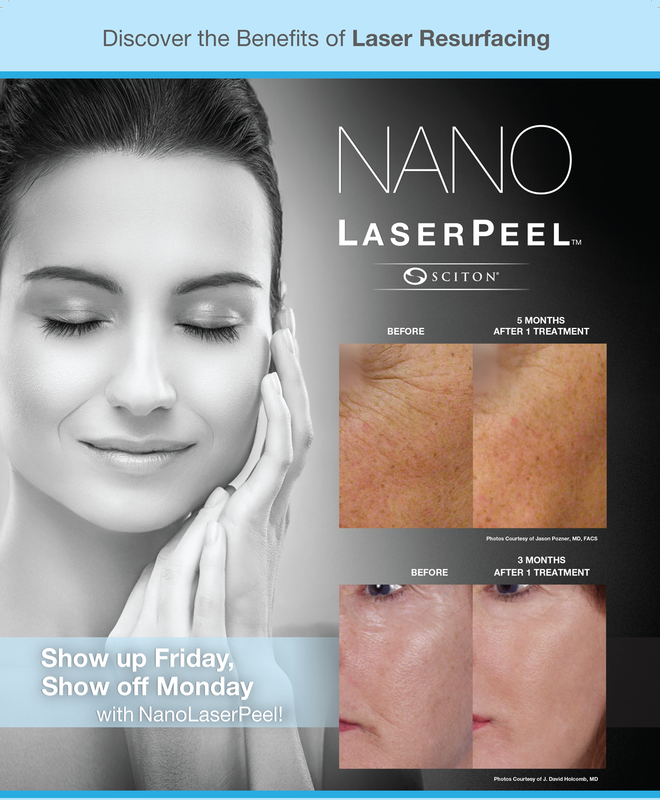 NanoLaserPeel™: Show up Friday, Show off Monday! Let’s talk about a very cool treatment we can perform for you here at Azura using our Sciton JOULE™ laser: the NanoLaserPeel™. This is a laser treatment that removes a very thin layer of damaged skin (up to 10 microns – for those who are interested in that sort of thing) to improve the texture and provide a more youthful appearance. Removing the top layer eliminates some of the damaged cells that can give skin a tired, aged look. Bonus – it activates messenger cells to trigger the body’s natural healing process. As the skin heals, fresh cells grow and resurface the treated area. I like to say it will make your skin look more “airbrushed” or filtered! You will go from looking tired to vibrant… And we all need that. Fun Facts: A spider web is about three microns in depth. An inch is 25,400 microns! During: One of our providers will cleanse the treatment area and then don your protective eye goggles. You will get to hold a “personal air conditioner”, called a “Zimmer”, to keep you feeling comfortable and your skin cool. Once we turn on the laser, it can get a bit loud. No worries, you will still be able to hear us and we will be able to hear you. When we start the procedure, the laser beam will scan the skin and deliver its energy. This passing on the skin is removing the outer layer of the dead skin in a very controlled, superficial manner. It sounds like it would be painful but it is actually pretty easy. We have been polling our clients over the last few months and most clients say it is a two out of 10 on the pain scale – just feeling warm. Areas around the eyes and on the forehead are the most sensitive but still not painful. You will not even need a numbing cream! After: Immediately after, your skin will feel warm, like a sunburn. That will begin to calm down in a few minutes and continue to feel warm for about 30-to-60 minutes. Your skin will appear “frosty” at first and then change to pink over the next hour. You will appear a darker pink-to-red in the next 12-to-24 hours as the skin continues to heal and may continue to have a mild red or “dirty skin” appearance for three-to-four days. You can apply makeup after 24 hours, lightly, if you chose. You will use a gentle cleanser through this process such as the Soothing Cleanser by Azura or Cerave wash. You will also need to protect your skin with a light petrolatum base moisturizer like EltaMD® Intense Moisturizer the first day or two and then a lighter moisturizer going forward. You will also need a great SPF product such as EltaMD® Physical, Daily, or Shield. You will want to limit the higher chemical-based sunscreens such as most found over the counter. If you love the results, we recommend having this treatment one-to-three times to get to your desired results, spaced about six-to-eight weeks apart or incorporate this into other procedures you are doing. For maintenance, we recommend having this easy treatment performed every quarter.